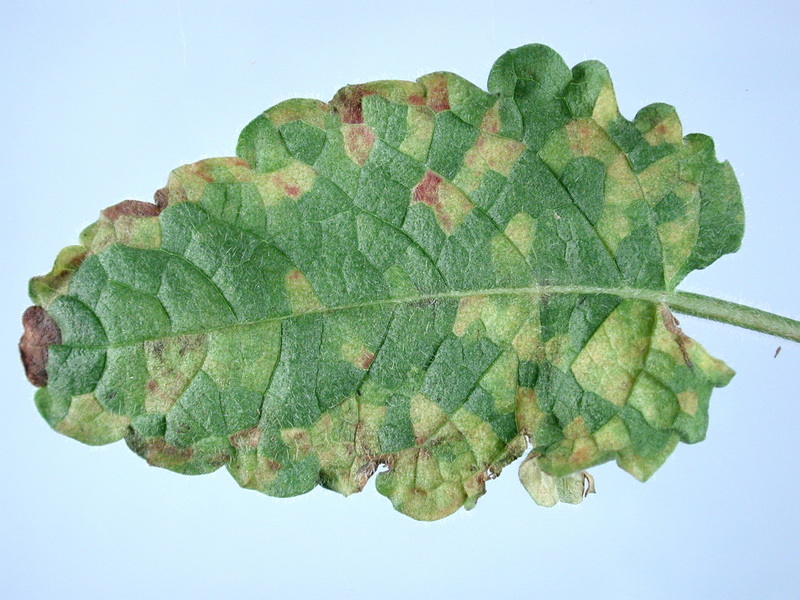 Angular lesions are due to the foliar nematode on thisStachys sp. The word nematode is derived from Greek words meaning “threadlike.” This, in turn, is partly responsible for our calling this group of invertebrate animals “thread-worms.” Nematodes, nemas, eelworms, and thread or roundworms are synonymous for the same group of organisms. The phylum Nemata, to which nematodes belong, occupies an intermediate position between the phyla Platyhelminthes (including flukes and tapeworms) and Annelida (including the common earthworm). Nematodes have been known as pests of humans since the dawn of medicine. Guinea worms, hookworms, pinworms, and porkworms are examples of human parasites studied thoroughly in a science called helminthology. Parasitology is a science devoted to the study of various parasites of animals, including nematodes. Plant nematology is primarily a study of the nematodes associated with plant life, although many investigators include those forms found in soil and water. As often stated, nematodes can be found anywhere life exists. Naturally, this includes a tremendous variety of conditions and situations. More than 10,000 species of nematodes have been described, including approximately 2,500 parasites of plants. Size and Shape Nematodes usually are regarded as being of microscopic size though a few species can be seen without magnification. Most plant-parasitic nematodes would range in size from 0.02 to 0.04 inch in length. As the common name eelworm implies, a great many nematodes have a worm-like or eel-like shape. Females of some kinds grow swollen at maturity and resemble tiny beans, lemons, or pears. 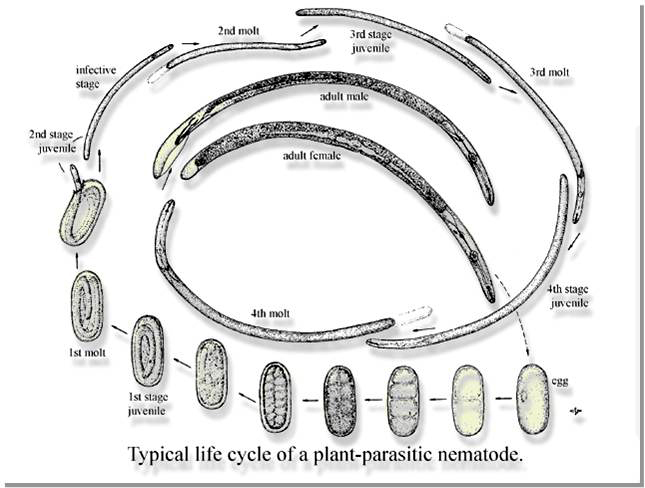 Life History Nematodes commonly have six developmental phases including an egg, four juvenile stages, and an adult nematode stage. Each juvenile stage is completed by a developmental process called a molt. Except for size, juveniles usually resemble adults. Reproductive organs normally do not appear until after the nematode has undergone four molts. Relationship to Plants Nematodes that affect plant growth, called plant-parasitic nematodes, are classified by feeding behavior. Nematodes that attack aboveground plant parts may be either ecto-parasites or endoparasites at different points in their life histories. There may be no damage at all, depending on the species and density of nematodes present, the susceptibility of the crop being grown, and environmental conditions. Many plants, if otherwise healthy, can tolerate moderate densities of plant-parasitic nematodes without sustaining significant losses in production. When nematodes are a problem, target patches of poor plant growth often are seen within a field that otherwise may appear normal. These patches may grow in size if untreated. Damage is variable, ranging from mildly chlorotic (yellowing) to patches where plants are severely stunted and plant density is low. Plants may wilt easily in hot weather. In other cases, the growth of the plant is little affected, but the quality of the marketable product is reduced by nematode infestations that cause tissue breakdown, deformation, or discoloration. Confirmation that nematodes are the cause of the observed damage, however, can be made only through examination of soil and/or plant material by trained personnel. Migratory ectoparasites cause a simple growth reduction of tops and roots. No symptoms occur other than that plants appear smaller than expected. This type of damage is difficult to diagnose unless the soil is examined for nematodes, because it could be due to a nutrient problem or some other cause. Stubby-root nematodes, Trichodorus spp., cause a mass of short, thick roots to develop and are easier to diagnose. Several migratory ectoparasites are more important as vectors of plant viruses than as pathogens themselves. Sedentary ectoparasites cause serious plant decline in citrus and severe stunting and chlorosis in soybean and pineapple but are not an important group in the Pacific Northwest. Migratory endoparasites may damage roots, leaves, seeds, or stems and bulbs, depending on the nematode involved. The most common are root parasites, which cause damage ranging from dark spots (lesions) on roots to a significant amount of root decay. The root system may be greatly reduced so that plants can be pulled easily from the ground. Plants may be severely stunted and appear to be water-stressed. Foliar nematodes cause water-soaked leaves and distortion. Stem nematodes cause swelling and distortion of stems, thinning of stands, and severely chlorotic stems and leaves, called “white flagging.” Seed-gall nematodes cause formation of galls in place of seeds in grasses and cereals. Sedentary endoparasites such as root-knot and cyst nematodes are the most damaging nematodes on a worldwide basis and are responsible for billions of dollars in crop losses each year. Root-knot nematode symptoms include a reduced root system, changes in root structure due to much swelling and galling, hairy-root conditions due to stimulation of lateral branching of the root system, and reduced tops. Cyst nematode symptoms are reduced tops, hairy-root condition, and reduced root systems. Root crops such as sugar beets often show reduced size. The presence of cysts is valuable in diagnosis. Nematodes, primarily endoparasites, interact with other plant pathogens to form disease complexes. Lesion nematodes interact with Verticillium dahliae in potato (Verticillium wilt or Potato Early Dying) and also contribute to invasion by root-infecting fungi in many crops (such as apple replant disease and black root rot complex in strawberry). Naturally, most conspicuous signs of plant injury are on aboveground vegetation. Many conditions and organisms may cause distorted or stunted plants, so it is always wise to confirm any diagnosis by microscopic examination. Certain nematodes cause swellings, thickenings, galls, or other distortions on aboveground parts of plants. Dwarfed and distorted plants also may result from an underground invasion of nematodes. Other symptoms, not normally observed until the soil has been removed, also occur as root swellings (galls), lesions or dead spots, reduction to a short, stubby-root condition, and general root breakdown. As before, diagnosis should be confirmed by microscopic examination of infected tissue. Diagnosis and proof is much more difficult to establish in cases of ectoparasitic nematodes. Confirmation of injury by this group depends upon a microscopic examination of soil surrounding root systems of injured plants. How Are Plant-parasitic Nematodes Spread? Why a nematode pest appears in an area is always a debatable issue. Certainly some have been in the area a long time, probably associated with natural vegetation before cultivation. Then as the area was brought under agriculture, the nematode pest began to feed and reproduce on the cultivated crop. Most workers regard these nematodes as indigenous (native). Other nematodes undoubtedly came from other areas and were introduced by one or more agents. Nematodes usually are brought to new areas by movement of soil, water, and plant material. Agricultural practices such as clearing or leveling land, cultivation, and irrigation are important in moving nematode-infested soil. Carefully cleaning farm machinery between fields is a cheap, effective way to reduce movement of nematodes from infested to noninfested fields. Nematodes frequently are established in a new area with plant material. Plant propagation material (seeds, bulbs, tubers, cuttings, and transplants) can conceal numerous kinds of nematode pests. Naturally, cuttings and transplants rooted in soil greatly increase the chance of pest introduction. Wind and animals also may move nematode pests. There is a taxonomic system of classification for nematodes, but a system based on the plant part invaded is more convenient. Wheat nematode, Anguina tritici, on wheat. Grass seed nematode, Anguina agrostis, on bentgrass and Chewings fescue. Spring dwarf nematode, Aphelenchoides fragariae, on lily and strawberry. Chrysanthemum nematode, Aphelenchoides ritzema-bosi, on chrysanthemum, African violet, ferns, and azalea. Bulb and stem nematode, Ditylenchus dipsaci, on narcissus, strawberry, alfalfa, red clover, primrose, garlic, and onion. Potato-rot nematode, Ditylenchus destructor, on potato and dahlia. Root-lesion nematodes, Pratylenchus sp., on fruit trees, small fruits, mint, field crops and ornamentals. Root-knot nematodes, Meloidogyne sp., on some 2,000 kinds of plants. Cyst nematodes, Heterodera sp., on cereals, sugar beets, soybeans, hops, and clover. Stubby-root nematodes, Trichodorus sp., on vegetables. Dagger nematodes, Xiphinema sp., on grape, rose, apple, and blueberry. Needle nematodes, Longidorus sp., on peppermint and bluegrass. Pin nematodes, Paratylenchus sp., on fig, vegetables, and mint. Certified seed and other propagation materials. Modification of cultural practices to avoid spreading or perpetuating the disease. Using nematode-resistant or tolerant varieties. Hot-water treatment of diseased propagative materials. Pruning and removing diseased parts. Applying nematicides at planting or during the growth cycle. Chemical soak or dip treatments for diseased stocks. Soil fumigation with chemicals before planting. See Section 5 of this handbook. Crop rotation and summer fallow. Cover crops and green manure. Studies show that at least 55 weed species, including many of the common weeds, are hosts of root-lesion nematodes (Pratylenchus penetrans). Some common weeds are lambsquarters, redroot pigweed, common purslane, common chickweed, wild mustard, fireweed, wild carrot, common milkweed, field bindweed, common plantain, goldenrod, common ragweed, common groundsel, Canada thistle, Scotch thistle, chicory, and common dandelion. Pratylenchus penetrans also has a wide host range in plants other than weeds; a host list of 232 plant species belonging to 126 genera in 51 families is known. There is considerable variation in the ability of P. penetrans to infect and reproduce in these hosts. It appears that P. penetrans can penetrate and reproduce more readily in perennial weeds with soft-textured roots than in annual weeds with hard-textured roots. The former hosts could act as reservoirs for large numbers of overwintering P. penetrans, posing a potential threat to any succeeding crop susceptible to this nematode. In addition, winter-active annuals such as common groundsel are important winter reservoirs. Weed control should be an important part of any nematode control program. Reference Townshend, J.L. and T.R. Davidson. 1960. Some weed hosts of Pratylenchus penetrans in premier strawberry plantations. Canadian Journal of Botany 38:267-273.